WASHINGTON (CNS) — A special Mass Dec. 5 and an exhibit at the Basilica of the National Shrine of the Immaculate Conception in Washington celebrated the winners of the annual Christmas artwork contest sponsored by the Missionary Childhood Association. They can illustrate the Christmas story using images of shepherds and angels, the Three Kings and the Holy Family, the animals present by the manger, and the infant Jesus. 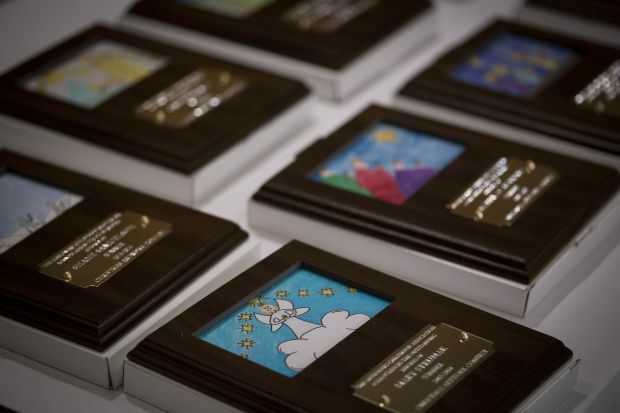 Each year, 24 winners are chosen and their works of art are featured as e-greetings on the main Missionary Childhood Association’s website — www.MCAKids.org. The artwork remains on display at the national shrine through Epiphany, which is Jan. 6. Fifteen winners and their families attended the celebration in Washington, including this year’s grand prize winners: Ruby Pruitt from Godfrey, Illinois, in the Diocese of Springfield, and Emily Kim from the Diocese of Arlington, Virginia. The 2014 winners are from the archdioceses of New York, Chicago, Los Angeles, San Francisco, Miami and Philadelphia; and the dioceses of Brooklyn, New York; Metuchen, New Jersey; Harrisburg, Pennsylvania; Arlington, Virginia; Springfield, Illinois; Venice, Florida; and Wichita, Kansas. Two winners are chosen to have their artwork be part of the national director’s Christmas card. Beginning in 1916, what is now the Missionary Childhood Association issued Christmas seals. The association started using children’s artwork on the seals in 1933. In 2005, it created Christmas cards with the youngsters’ artwork; e-greetings with the winners’ designs were introduced in 2007.